The hidden cost is a great point. The other "hidden" cost is the value of your time. Depending on where the tailor is, how many fittings, cloth selection, etc. you could easily be 10-30 hours of committed time in to try a new tailor. For many, that time commitment / opportunity cost is the biggest investment, especially for many who can afford regular bespoke. Then to have an outcome that is less than desired, that can be really frustrating. 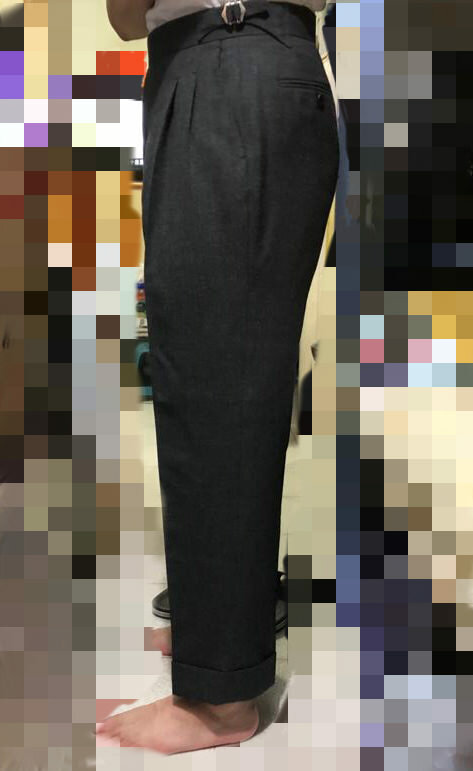 Another reason I think twice about trying another tailor. I don’t want to deal with another fitting and having to deal with certain quirks of the house style. Just get back the trousers from the tailor, but it seems that there is still some extra fabric in the side of the trousers. The ease at the hip is to allow you to sit down surely. All dress trousers have this, so you feel it is excessive compared to your other dress trousers? Did u press the trousers properly? I think u are concerned about the fold. I would be more concerned about how short the hem is. ^^^^^This. Sitting down, those are going to ride up half-way to your knees. Best be wearing OTC socks. The slight fold on the side should go away with a proper pressing. The drape is great--I wouldn't take the chance of ruining it by altering the width. Any recent experience with Biagio Granata? He's been promising delivery of a suit for a while and its making me real nervous as he's paid in full including shipping. Let me know how this ends up - I was curious about him. He seemed like a young inexperienced tailor, and maybe you're paying a lower price for the lack of experience. I generally feel like budget bespoke is just that - budget bespoke. I think there are diminishing marginal returns when you start knocking on the door of the 4-5K threshold (indeeds, the returns are diminishing if one looks at Huntsman!). But, keep in mind, hes a tailor from napoli. Impunture nella; rever, risvolto, martingala, tasche, taschino. Have fun keeping it clean. ....said on a forum where dozens of people own winter white flannels. Hi guys - how important is it to have the collar of a jacket attached by hand? Are you compromising a lot on quality by having the collar attached by machine where the suit is full canvas and lapels are hand padded? Depends on what aspect of quality you are referring to. If you mean "will it last as long?" then yes, properly machine made seams are just as good as, or better than handmade. If you mean "is it as artisanal/sartorial/fun to look at?" then no, it isn't. As important as you deem it. Few people will see the difference.